I purchased two Adirondack chairs and a foot rest from a thrift store for less than $50 several years ago. They had never been painted or stained and were very weather worn and not very sturdy, but I saw potential. When I first got them home, I made them a little more sturdy by adding some more screws and replacing the back brace that was broken on one of the chairs. 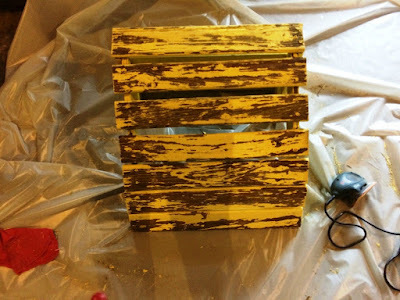 I also primed and painted them a cheery Sun Yellow from Rustoleum. Even though we stored them in the garage each winter, the elements had still taken a toll on them over the last few years. 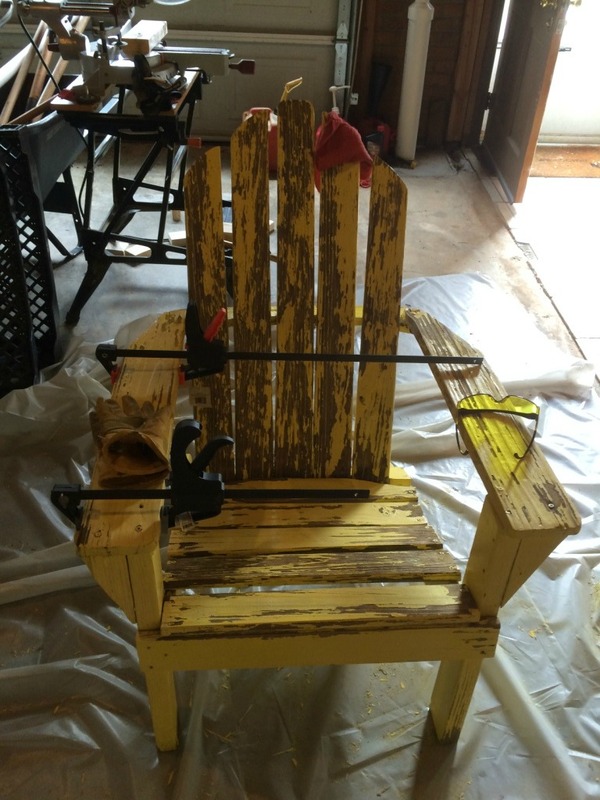 The paint was starting to flake and the wood on the arm rests had started to split, so I decided this past spring that I would rehab them. I first gave them a good washing with the water hose, which knocked off a bit of the loose paint. I then used a belt sander and an orbital sander to sand the majority of the flaking paint down, in order to have a smooth surface to work with. I also put a little wood glue in the cracks in the arm rest where the wood was splitting and held it together with clamps while it dried. Here are what the chair and foot rest looked like at this stage. 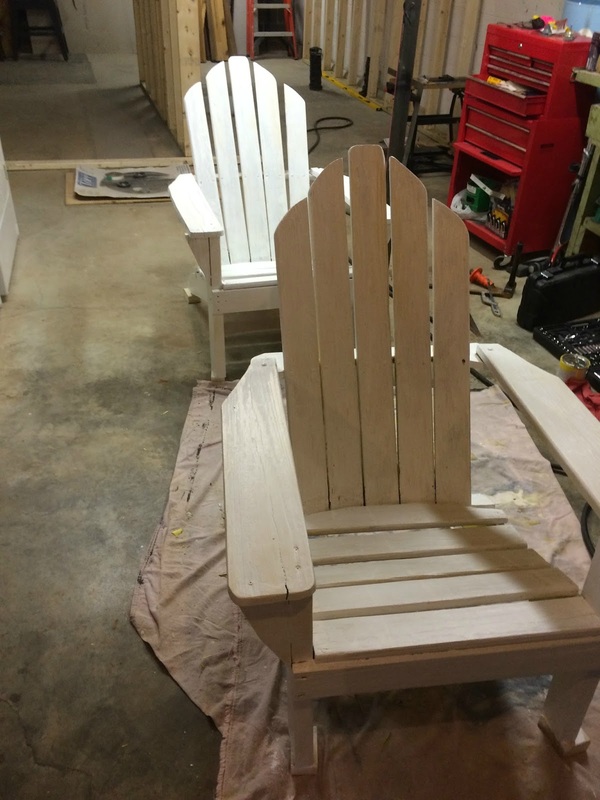 I then used Kilz Primer to prime the chairs and footrest. I only used one coat this time, but the first time I painted them, I used two coats for protection. Once dry, I applied two coats of Rustoleum Ultra Cover Gloss Sun Yellow, letting it dry in between each coat for the recommended time. Here are what the finished chairs and footrest look like, with a couple of pillows added from TJMaxx. I get the most compliments on these! No one can believe that I bought these at a thrift store and re-finished them myself! 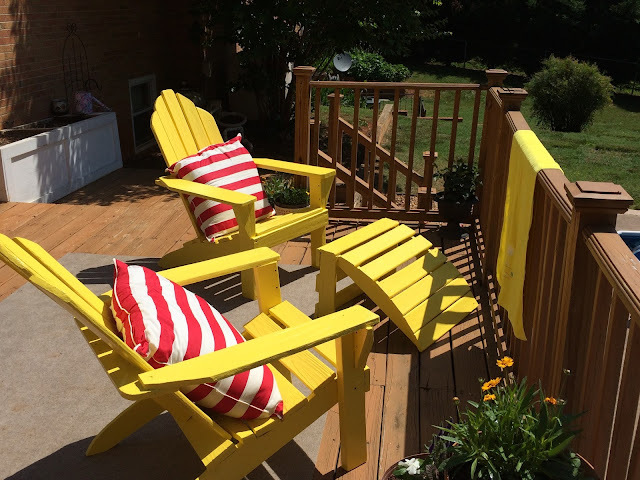 Check out more outdoor ideas at the Outdoor Extravaganza Link Party!